This event is no longer available. Please check in for highlights from the weekend! It's official- Registration for the Pond Boss VII Conference & Expo is now open! From Oct 12 through Oct 14, 2017 we look forward to seeing you at the beautiful La Torretta Lake Resort & Spa in Montgomery, Texas. From the Pond Boss Fishing tournament to Saturday night's Banquet Dinner and silent auction, Pond Boss VII won't disappoint. Come and learn the latest techniques about managing your private waters, from pond construction to wildlife management. 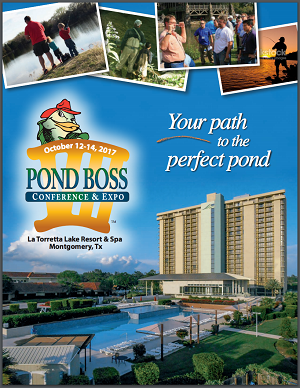 Join us at the Pond Boss VII Conference & Expo October 12-14, 2017 at the La Torretta Lake Resort and Spa in Montgomery, TX. Located just north of Houston near the beautiful Lake Conroe, our upcoming conference is sure to be an event you don't want to miss! Contact our office (800-687-6075) to register, visit our store to shop for the registration package that best fits your needs or download our registration form. Contact LeighAnn today to reserve your booth space! 800-687-6075 or Download our registration forms and other materials below or email leighann@pondboss.com for more information.